British tourists and travellers heading by road for Paris and points beyond for the summer are likely to take the autoroute. Not so long ago however the principal route was the old RN 1 which took the traveller from Calais or Boulogne almost due south via Montreuil, Abbeville, Beauvais and Beaumont-sur-Oise, and into Paris past the Basilica of St Denis. 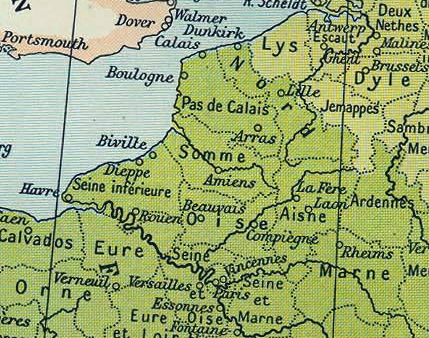 Map of Northern France from Calais in the north to Paris in the south in 1811. Image credit: Wikimedia Commons. This route is actually very old. It was a former royal post road and, for the French kings, a strategic route to the northern frontier, which was vulnerable to hostile incursion from Flanders or England. Invaders of less menacing intent typified the traffic in more recent times. 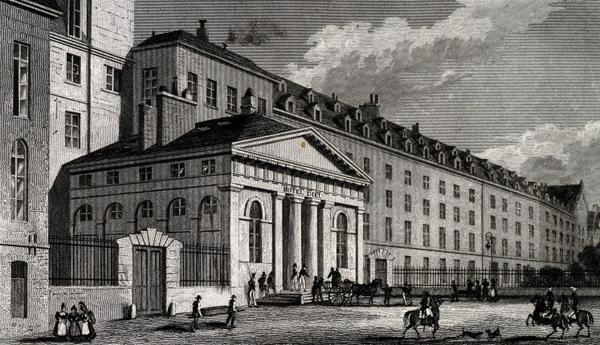 A significant minority of British travellers in the first half of the 19th century were medical students attracted to the French metropolis by its reputation as the leading centre of medical training in Europe. The Library holds several records of this student migration. Coincidentally, two students crossed the Channel to Calais within a day or so of each other in September 1818 and left us accounts of their journey. Eighteen year old Thomas Morson, a prospective apothecary from London, was heading for Paris to further his pharmaceutical education; John Sims, a Mancunian medical student who had just received his MD from Edinburgh, was embarking on a continental tour of hospitals and other institutions. 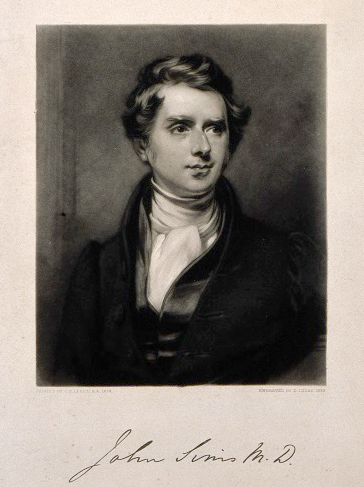 Mezzotint of Dr John Sims, by D. Lucas, 1839, after C. R. Leslie, 1824. Wellcome Library reference no. 8782i. Both took a large ‘diligence’ – the French equivalent of the British stage coach – that covered the 270 km journey to Paris in about 36 hours. Stops were made for meals – lunch in Boulogne, dinner in Abbeville, breakfast in Beauvais – (and presumably for changing horses, though this is never mentioned by the travellers), but otherwise the conveyance rumbled on through the night. “The appearance of the diligence is most ridiculous and clumsy”, commented Dr Robert Lee, another English traveller in 1822, “and such as would attract a crowd of people in London to look at it. It seems very heavy and the horses are not better, or so good as the cart horses in England, and yet they manage at the rate of 5 miles an hour”. 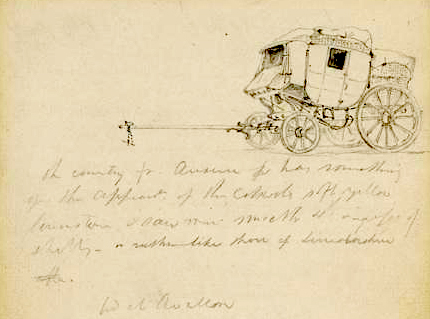 A sketch of a small diligence from Joseph Jackson Lister’s Journal of a Tour of the Continent, 1817. Wellcome Library reference MS.6962. The culture shock that greeted British visitors after barely 21 miles of sea crossing – an effect enhanced by a generation-long interruption of peaceful interaction between France and Britain – is encapsulated by their wide-eyed first impressions. The country, though geologically similar to Kent, looked different: then as now the fields were unhedged, which made an immediate visual impact. The villages were generally made up of miserable, small white-washed thatched cottages. Food at the inns comprised a succession of small courses rather than a single hunk of beef, as was the custom in England. The towns were walled and their gates guarded by militia – again unheard of back home. 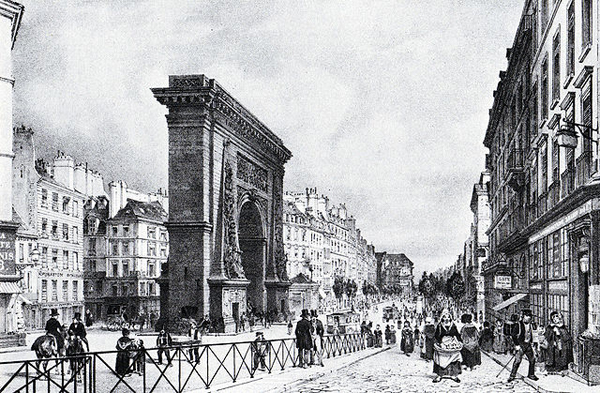 Porte Saint-Denis, Paris around 1840. Artist: Ph. Benoist. Image credit: Wikimedia Commons. The draw of Paris was above all the greater opportunity for practical experience, particularly in dissection. A House of Commons Committee in 1828 heard that there were “200 English students of anatomy … pursuing their course of instruction” in Paris, encouraged no doubt by a plentiful supply of cadavers, which were in the words of an anonymous medical student some years later “as cheap as herrings in England”. The French were less squeamish about the ceremonious disposal of the dead – after all the Paris morgue was a tourist attraction. Even after the passing of the Anatomy Act (1832) human cadavers were more readily available for hands-on student instruction in Paris than at home. This did not always guarantee untroubled access to subjects for dissection. James Surrage, another English medical student , complained in a diary entry from 1835 about being charged extra for dissection by an intern-instructor at the Charité hospital: “I thought he was somewhat better than the majority of Frenchmen, but I find they are all alike – their sole business & delight seem to consist in taking in or endeavouring to take in the raw ‘Englishers’”. 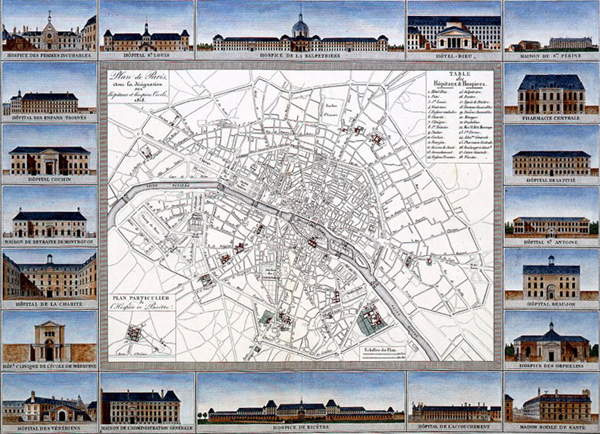 Map of the hospitals in Paris in 1820. Image credit: Wikimedia Commons. the Parisians “cannot look forward to [sickness] with the same anxiety as in England, for their hospitals are so comfortable and admission is so easily procured, and there is no feeling of degradation by going into them, so that few remain at home when indisposed except those who are wealthy and independent”. These institutions were municipally funded and seem to have been entirely under the control of their senior physicians and surgeons. Guillaume Dupuytren, for instance, chief surgeon of the Hotel Dieu, ruled his wards like a dictator. This no doubt facilitated the role of Paris’s hospitals as excellent centres for medical research and education but it is not clear that their patients were thereby better served, whatever advantage may have accrued to future generations. The Hôtel Dieu, Paris. Line engraving by R. Wallis, 1830. Wellcome Library reference no. 21846i. On admission patients seem to have surrendered all rights to autonomy and privacy, let alone equal status with their ‘carers’. John Sims was favourably impressed by the Charité hospital but noted that “a man who seemed to be in attendance showed us without any ceremony into the women’s (bath)room at a time when some of the baths were occupied”. 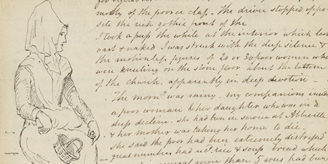 James Surrage was delighted to find he could inspect pregnant women, both externally and internally, in a way that was impossible in Edinburgh. Visiting students and observers were admitted to wards with minimal preliminaries; students jostled for space and a view round patents’ beds; patients were operated on while the surgeon provided a running commentary to a crowded lecture theatre; a patient whose treatment went badly was liable to be blamed for failing to answer his physician’s initial questions accurately. 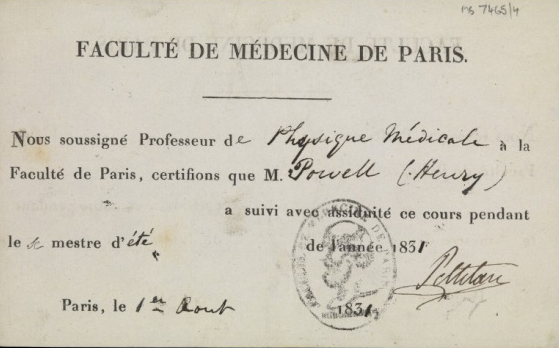 Certificate of attendance at lectures signed by Pierre Pelletan, Professor of Pathology, on behalf of an English medical student, Henry Powell, 1831. Wellcome Library reference: MS.7465. Study in Paris was inevitably part of a broader engagement with French culture and manners that helped mould the outlook of many who returned to work at home. Even the increasingly miserable and xenophobic Surrage occasionally delighted in the theatre and the Louvre. Thomas Morson, who ended up spending three years in Paris, eventually returned with his master’s daughter as his wife. More importantly for his business career he also returned with a fund of cutting-edge knowledge about pharmaceutical chemistry. 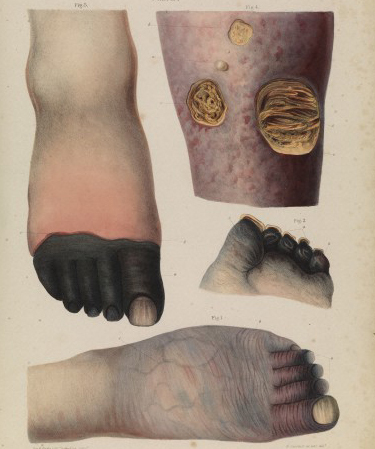 Stages of mortification (gangrene) from Pathological Anatomy by Robert Carswell, 1833-1838. For Robert Carswell, appointed the first professor of pathological anatomy at UCL in 1828, the materials he had compiled over many years of observation, dissection and drawing in France, formed the foundation of his textbook, Pathological anatomy: illustrations of the elementary forms of disease. 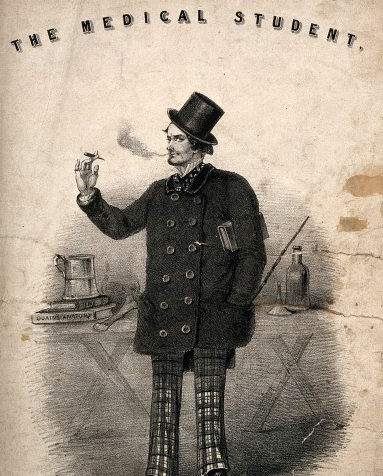 A foppish medical student, lithograph, 1854. 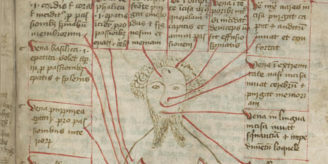 Wellcome Library reference: 10942i. Even for those who only spent brief periods in the French capital, the experience could be transformative. We know almost nothing about the future careers of Sims and Surrage, but exposure to a world of alternative possibilities – from styles of medical training to relations between the sexes – must surely have marked them for life.